When life plays you a sorry set of cards, what options do you have? Play the cards you’ve been dealt? Fold and sit out a round until you get something better? Ha! Madame Sarkosa laughs at those options! She reads the cards that life offers in a way that none other can. She sees what cards will be coming and where best they should be placed. Because, a gypsy is never caught by surprise. She is the one who brings the surprises! Because, when a fate is not what one should be, Sarkosa and her sister fortune tellers have a little more magic readied to ensure that those who might offend will stray far away. The gypsy curse is not one to mock, lest you find all the worst cards laid before you! But, the life of the gypsy fortune teller is not all cards and fate, not all curses and vengeance. It is a life of mysterious song and fluid dance, of vivid colors and, of course, flashy jewelry! The roaming gypsy camps are for dance and song, for roaming and exploring, for living bright and passionately. 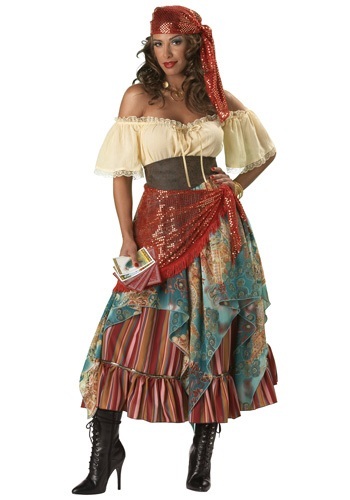 It is time to show your cards with this Elite Fortune Teller costume. A brilliant array of colors can be seen from the yellow peasant-style top, brown vinyl belt, and multicolored scarf-like skirt. Twirl to give life to the uneven ruffled trim and safely flourish the fabric while you dance thanks to the tulle petticoat underneath. Add the right assortment of jewelry, high-heeled boots, and a dazzling headscarf to complete your look and have everyone desperate to hear what the student of Madame Sarkosa has to reveal. Great costume! Very comfortable, well-made and fun!